You don’t have to deal with the killer leg cramps from a 14-plus-hour flight to experience the islands of French Polynesia when you can just throw back stiff, fruity cocktails at exotic-themed drinkeries right here in Chicago. 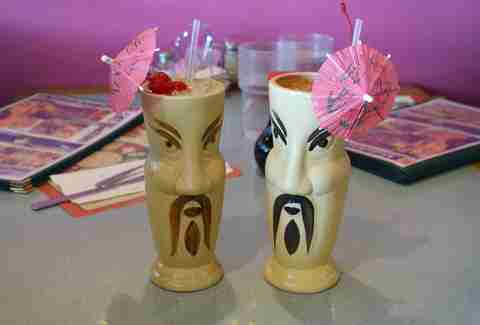 From a Tiki-inspired underground speakeasy to tropical dim sum to a karaoke mecca packed with rum-filled revelers, the Tiki scene is still humming in this city and its ‘burbs, offering boozy nectar served up in a conch shell. 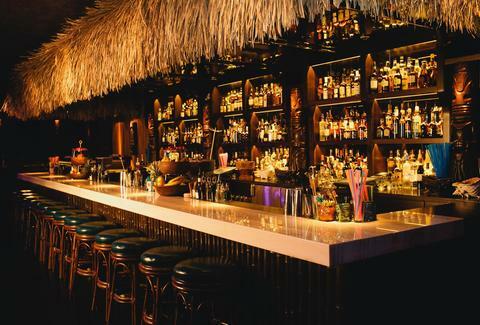 We’re holding a torch up to 14 of the best Tiki bars around, so sit back, stretch your legs, and put an umbrella in it. 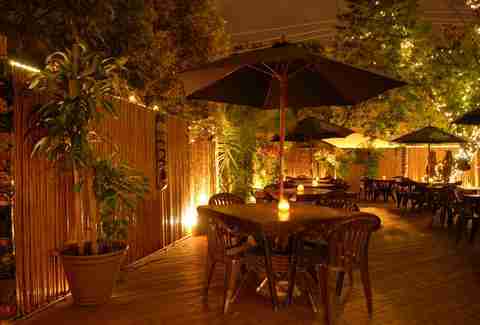 Part speakeasy and part Tiki bar, this subterranean sanctuary is hidden in the middle of the city. Access to riffs on classic Tiki cocktails, crafted for present-day beachcombers, is granted through an alley entrance where patrons pass a wall of blue skulls on their way down (you’re a fan of hidden bars, right?). Many of the wooden Tikis and artifacts once belonged to Chicago’s former Tiki hub, Trader Vic’s. 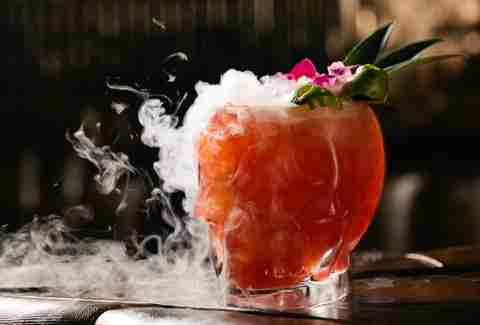 Of the “What one rum can’t do, three rums -- and a gin and a whiskey and a brandy -- can” mentality, its selection boasts drinks served in glass skulls and treasure chests with dry ice fog pouring out. What you're getting: The Dr. Fong is touted by many as the go-to signature drink, and its secret family recipe has been carefully guarded since 1976. 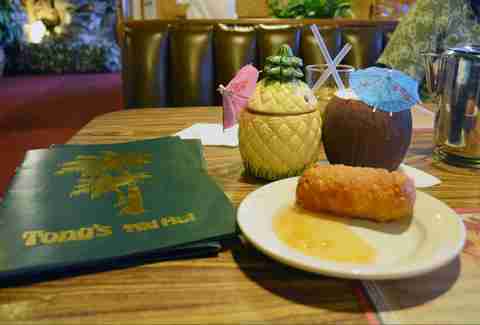 This '70s-style Tiki venue has Asian fusion specialities and popular island favorites like Coconut Fried Shrimp Po’ Boy Sliders, plus the super-cheap tropical drinks you’ve been looking for. 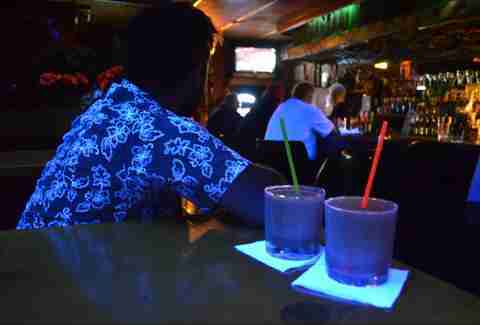 Elvis impersonators, Aloha Chicago’s hula dancers, and fire-throwing performers put on shows here monthly, making it a festive atmosphere for swilling fruity drinks like the mysterious, neon green Dr. Fong, so your designated driver will at least have some fun. 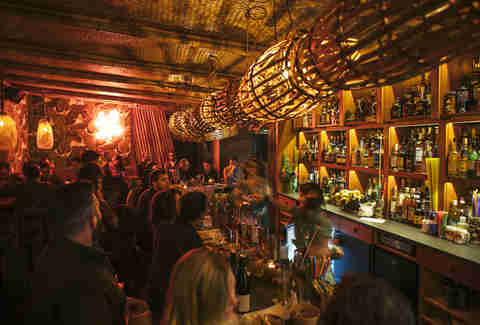 Under a roof of lauhala and between the walls of iconic banana leaf-print wallpaper, Chicago’s Tiki mogul Paul McGee (of Three Dots and a Dash fame) brings tropical vibes to Logan Square. 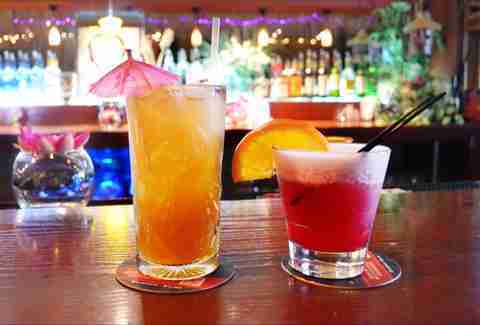 The easygoing Tiki bar offers an island influence without the heavy theme park kitsch factor, and artfully crafted drinks are served in traditional Tiki wares, as well as shells and other sea-inspired souvenir glasses. 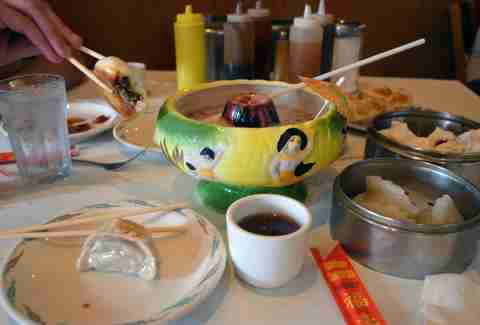 End your mini vacation with takeout Chinese from the neighboring Thank You. If you can get past the retro interior of the dimly lit, eclectic-sounding main lounge of this neighborhood haunt, you’ll find unexpected solace on its back patio. The beer garden with a Tiki vibe has drinks complete with the little umbrellas you’ve been seeking, and you’ll be able to gorge on pulled pork nachos and Cubano sandwiches al fresco. After all, if you were on a real island, you’d be outside, right? Amid the oversized palm fronds and totally Tiki kitsch, you won’t even remember you’re in a Des Plaines strip mall when you catch one of its action-packed shows against the backdrop of a couple 12ft Easter Island moai statues. Every Friday and Saturday night, its luau show, Echoes of Polynesia, features hula dancers and warrior chants from a variety of islands. Turns out, this is a fantastic way to embarrass someone on stage for their birthday or anniversary if you let them know what you’re celebrating ahead of time. 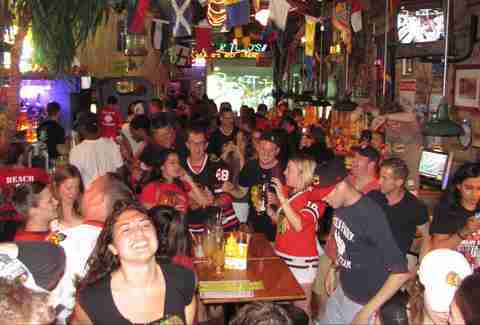 Grab a mic and a tropical drink (or three) at this Wrigleyville Tiki-themed karaoke/sports bar. If you’re walking in stone-cold sober, a potent Pain Killer will be your go-to choice for the evening, so you can stomach the inevitable sloppy bachelorette party renditions of “Don’t Stop Believin’” or the guy trolling the bar with Nickelback songs. Plus, it’ll be fresh-squeezed and rum-infused liquid courage for your turn on stage. In Tahitian, the name of the quintessential Tiki cocktail “Mai Tai” apparently means “out of this world.” This Tiki lounge puts its own twist on Trader Vic’s original recipe from 1944, and it challenges you to find a better one. You could do that... or just stick around for any number of live performances from iconic bands and vocalist groups like The Drifters and board the “Love Train” instead. It can be difficult to sustain a Tiki-themed establishment for very long, but this mom-and-pop “hut” has been around for more than 30 years. 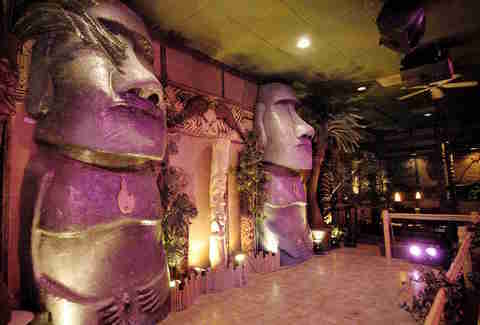 With a giant Easter Island Tiki head at its core, storefront windows and doors covered entirely by bamboo, hanging decor (like lobsters, “Tiki god” masks, and woven fish traps), and large murals dedicated to the motif, the restaurant/bar caters to the dine-in and takeout crowd and boasts the “best egg rolls” in town. And the piña colada might just have the creamiest coconut and rum blend you’ve ever tasted. All those Tiki cocktails can add up quickly, but this traditional Chinese abode has beverages that can easily accommodate two rum guzzlers for the price of a single drink at other fine establishments in the city. Load up on some damn-good dim sum while imbibing in giant, communal “volcano bowls” that include raised reservoirs filled with blazing 151-proof rum for $14 each. 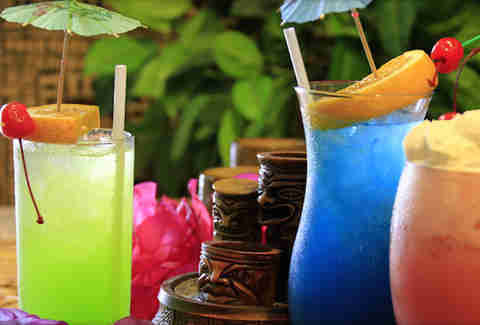 This Tiki joint with whimsical island decor has a mix of Chinese- and Polynesian-themed cuisine with tropical drinks and a lunch buffet for less than $7 each. Check out the Zodiac signs of various celebrities (did you know Sigmund Freud was a Dragon? ), as well as your own while guzzling strong, fruity punches. 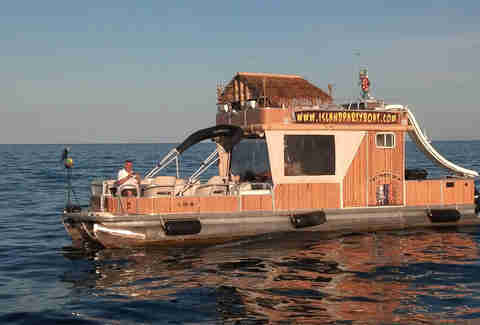 Tiki-philes can take their festivities to the next level via a waterslide-equipped Polynesian party barge out of Monroe Harbor. Seafaring groups of up to 36 people (and even their pooches) can cruise Lake Michigan and the river on one of eight vessels in the fleet, including the 50ft "Big Kahuna" or the smaller "Polynesian." Once you’ve downed a few fruity margaritas, continue the party at their new Tiki hut on the Chicago Riverwalk, where they have a full bar and live music on Saturdays, not to mention the "Kahuna Burger" with fresh pineapple chutney you’ll be needing to soak up the booze. 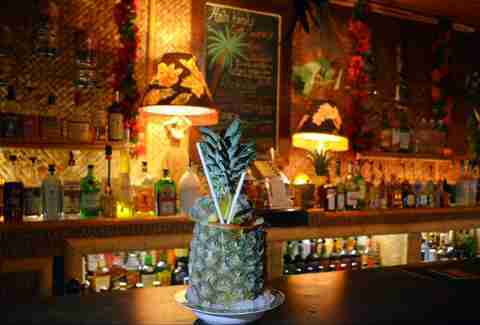 Named after a pineapple plantation in Hawaii, this lounge nobly sets a high torch for Tiki enthusiasts. Replete with soft-glowing hula girl lamps, blowfish-turned-light fixtures, wooden statues and signage, and an outdoor oasis, it’s a shrine to all things Tiki. Choosing from the pages of its extensive beverage menu is an adventure. Should you opt for the impressive Hala Kahiki in a frozen pineapple (and you should), it’ll be hard to pace yourself before you hit the bottom. But then you can ask for a spoon to finish it off as a rum-drenched slushie.